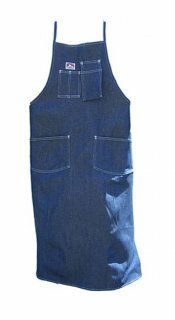 When it is time to roll up your sleeves and get to work in the shop, it is time to grab this Ben Davis® denim apron. The sturdy denim will keep the clothes underneath looking presentable and free from spills, smears, and dust. There are plenty of pockets to hold essentials under the watchful eye of the Ben Davis® gorilla logo. When you don this apron, you'll be part of a 70-year tradition.